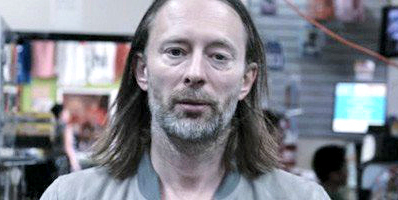 Having a camera focused squarely on Thom Yorke for 6 minutes, 25 seconds is never a bad idea. He’s impossible to look away from. Daydreaming is a beautiful song and totally depressing. In the video, Thom Yorke navigates a maze buildings and rooms that seem to symbolize the larger superstructure that society has created. He looks disheveled, old, and tired. The only respite, are the brief instrumental chorus sections where he’s back in natural world. To me, this symbolizes, a longing for the wonderment of childhood. When I referred to “the superstructure” (I’m getting the weeds here) I mean the systems and customs that have been put in place, by society, to manage your time. Like the “8 hour work day” for instance. Or the fact that we must remain in school, 7 hours per day, till we’re 18. In general — unscientific, unnecessary rules that keep us corralled and uncreative. Thankfully, and largely driven by Tech sector, we are becoming more conscious, and the veil is being lifted even faster. Old, unnecessary systems are being disrupted, in favor of smarter, faster, and more creative solutions. I didn’t feel the need to jerry-rig Thom Yorke’s vocal into this arrangement. The vocals are more of an auxiliary instrument in Daydreaming, and it would have been impossible anyway. Daydreaming has two brilliant chord progressions, both are vintage Radiohead: The verse scheme is bookended by the same melody while only the bass line changes. The chorus, is just a crazy series of arpeggios. The song begins with phase 1 of the Intro, which is played 2x. On the second go through, you’ll follow the arrow into the second phase of the introduction. The Verse is played 3x. On the 3rd go around, you’ll follow the arrow to the Chorus. The first two stanzas of the Chorus are played 2x, the next two are played once, while the last stanza is played 2x. On the second go-through of the Chorus, you’ll incorporate the open 5th string at the beginning of the first two stanzas. Finally, Daydreaming ends with two verse sections.